The 4th edition of the hardback-book (ISBN 978-3-8348-0907-0) comprises 434 pages. It describes the in-vehicle network protocols, standards as well as software architectures and illustrates the information in 245 figures and 103 tables. Described networks include K-line, SAE J1850, sensor-actor bus systems, CAN, LIN, Flexray and MOST. The book covers also CAN-based transport protocols such as ISO 15765-2 (ISO TP), TP 2.0 and 1.6 as well as J1939. Included are such profile specifications as e.g. KWP 2000, UDS (Unified Diagnostic Services) and on-board diagnostic. 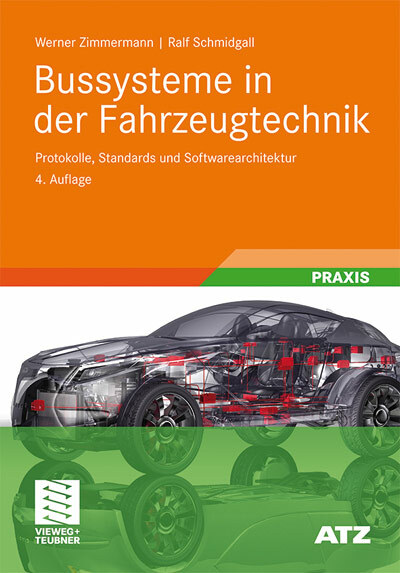 The book describes standards for measuring, calibration and diagnostics purposes as well as for ECU (electronic control unit) software (e.g. OSEK, Autosar). It provides a chapter about tools for design, development, diagnostics and testing of on-board communication solutions. Each chapter ends with a list of standards, which helps the reader to have a quick overview about the documents required e.g. for developments or a deeper insight. The data flow diagrams simplify the understanding of the quite complex protocols. The authors have added some critical statements and their personal opinions, which is very helpful to get a better understanding. The book is valuable for those readers, who like to get an overview of in-vehicle networking. It is targeted at development and application engineers from the automotive industry and its component suppliers as well as the students of concerned fields of study e.g. electronics, embedded systems, informatics etc.